The films of director Wes Anderson have become widely acclaimed for their idiosyncratic style and off-beat stories involving families and youth and his new film, The Grand Budapest Hotel, is certainly no exception. 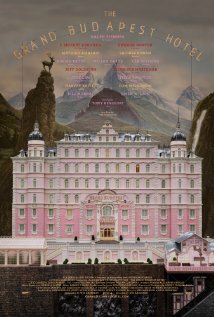 Following up what might be Anderson’s best film, last year’s Moonrise Kingdom, is difficult but The Grand Budapest Hotel holds its own with superb timing and an engaging, classic story set during an alternate version of the second world war that pairs the rags to riches theme with an innocent man being framed for murder. The film contains a brilliant, reoccurring cast with the addition of stars: Ralph Fiennes, Tony Revolori, Saoirse Ronan, and F. Murray Abraham, all of whom fit in fairly seamlessly. One of the most impressive aspects of the film is its precisely wound timing, which is akin to watching a domino show or a Rube Goldberg Machine. The film also has some very funny moments, especially from Anderson supporting regulars: William DaFoe, Jeff Goldblum, and of course Bill Murray as well as Tom Wilkinson. It marries all of the elements Anderson is best at: young love, stylized comedic settings, quirky interwoven story-lines, and is highlighted by Ralph Fiennes depth of character in the main role, which makes for a very entertaining 100 minutes. Fans of Anderson’s films will no doubt love it and it’s scope, humor, and enormous, all-star cast should help it’s appeal to wider audiences. The Grand Budapest Hotel opens in theaters nationwide on March 7, 2014.